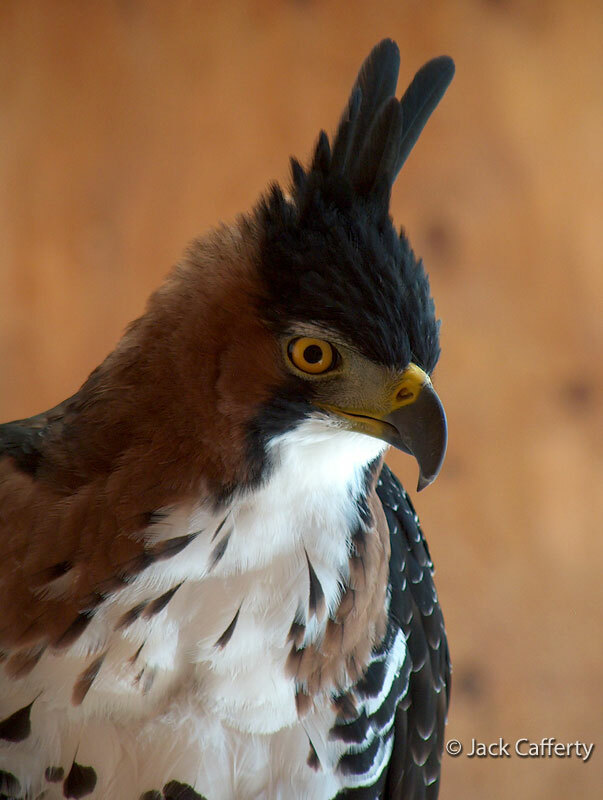 The long black feathers on top of an Ornate Hawk-eagle's head is called a crest, which can be lowered and raised at will. A raised crest can mean the bird is excited or curious about something. The Peregrine Fund spent nine years from 1988 to 1996 studying Neotropical birds of prey in the Peten region of Guatemala in an ambitious undertaking called the Maya Project. 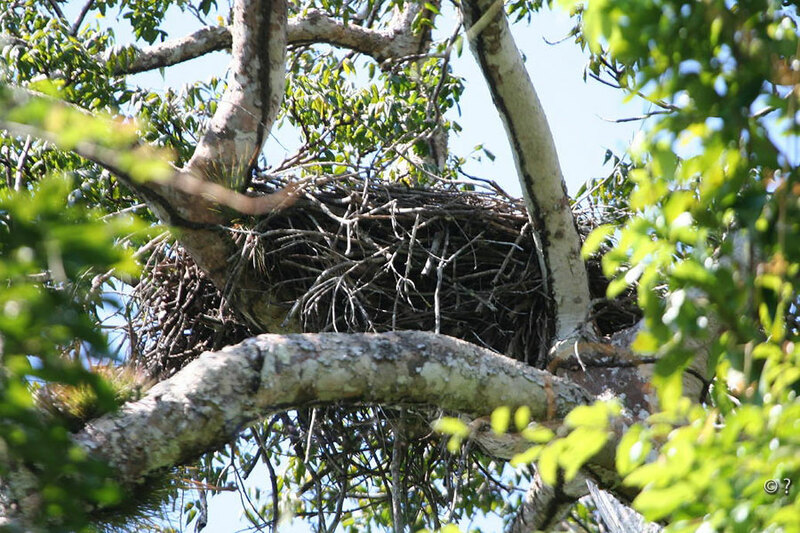 At that time, biologists located and studied several Ornate Hawk-eagle nests. This information helped contribute to the scientific world's knowledge of this species. This is important because the more we know about a species, the better we are able to help conserve it. 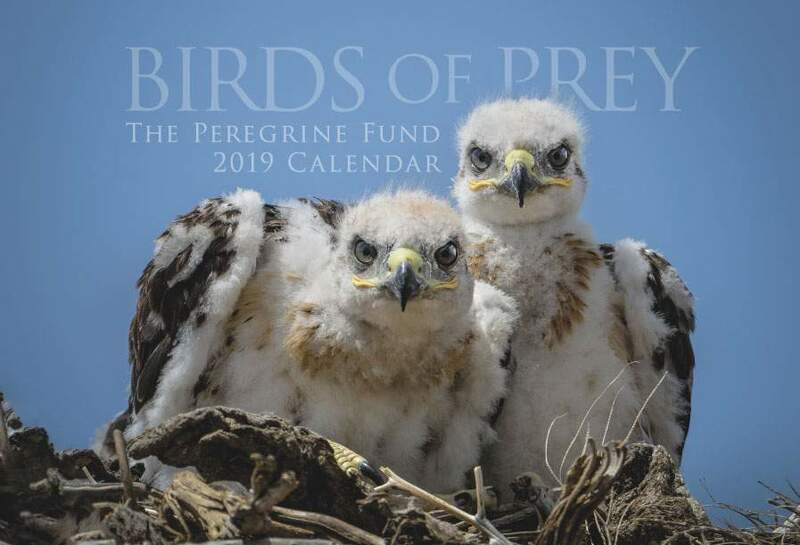 The Peregrine Fund published the results of the Maya Project in a book called "Neotropical Birds of Prey, Biology and Ecology of a Forest Raptor Community." Ornate Hawk-eagles are found in subtropical and tropical areas of the New World. Historically, they were found from southern Mexico through Central and South America all the way down to northern Argentina. Research has shown that this species will tolerate some disturbances to its environment and has been documented nesting in relatively small patches of forest near to human settlements, but it is sensitive to habitat fragmentation, edges, and human presence. 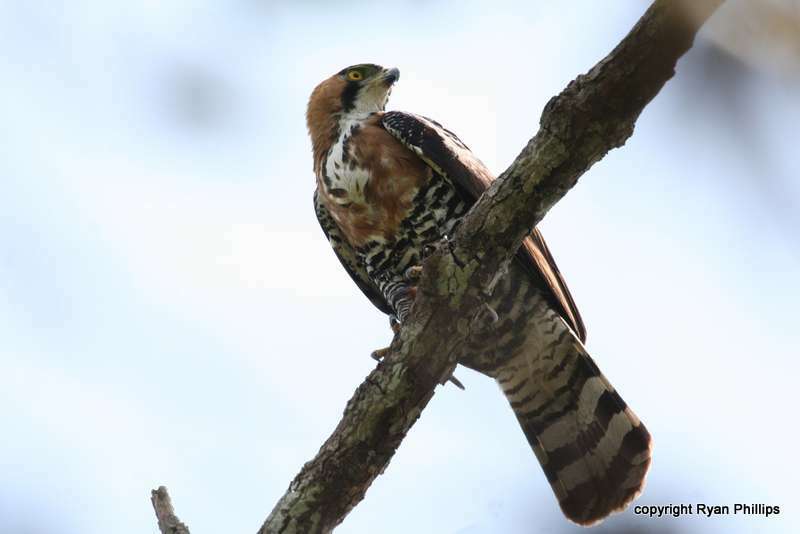 Simply put, this could mean that small Ornate Hawk-eagle populations can become cut off from other larger populations because habitat fragmentation makes it harder for them to disperse to other areas. The Ornate Hawk-eagle is a Neotropical rainforest species, though it is also found in pine forests, particularly in Mexico and Belize. These birds live at low to medium elevations, where they can find prey and large trees for nests. Their rainforest home is lush and vibrant and contains some of the highest biodiversity in the world. 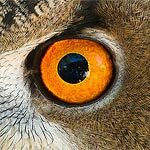 They live among jaguars, macaws, tapir, monkeys, sloths, snakes, frogs, and many other plants and animals – including the most powerful eagle in the world, the Harpy Eagle, and one of the fastest falcons, the Orange-breasted Falcon. The word "ornate" means flashy, showy, overly adorned. 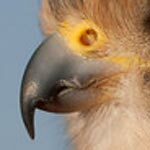 When looking at an Ornate Hawk-eagle up close, it is easy to see why it was given this catchy name. Its piercing yellow eyes, black forehead and crest, rusty nape, snow-white throat, and black and white striated breast and legs make this bird of prey one of the more colorful birds of prey in the region. These characteristics also make it a difficult bird to spot when perched as it blends in easily with the shadows and patterns created by the dappled sunlight, trees and vines of its rainforest habitat. Juvenile Ornate Hawk-eagles are also quite striking, but in their own way. Their bodies are dark overall and they have striking white shoulders, heads and crests. They often don't sit in semi-open areas but prefer the more heavily vegetated areas of healthy forests. You have a better chance of spotting this bird high up in the sky. The Ornate Hawk-eagle likes to soar. It does so fairly frequently, especially in the morning, and earlier than most other raptor species. 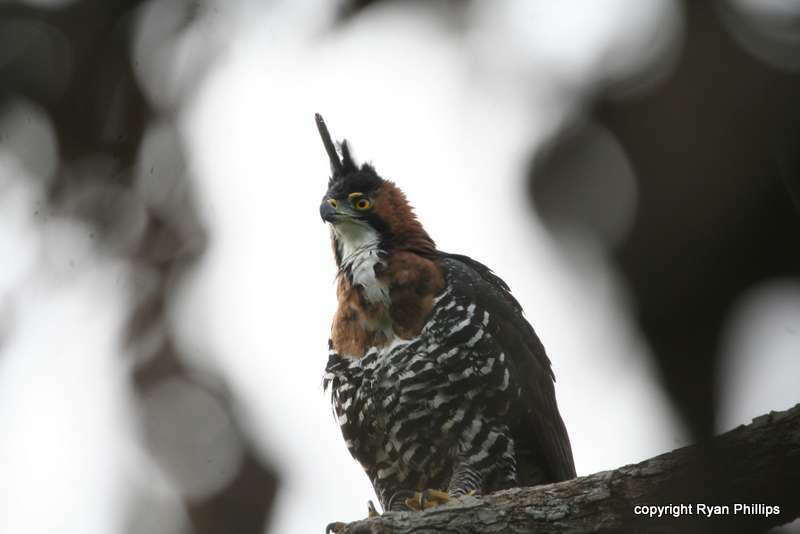 Like most wildlife species, the Ornate Hawk-eagle is susceptible to habitat loss. As more and more rainforests are cut down, there are fewer places for this beautiful bird of prey to go. If they are seen too close to human settlements, they are in danger of being shot by people who fear they may eat their chickens. Programs that support habitat protection, environmental education, and local economic sustainability are helpful in the conservation of this important rainforest species. 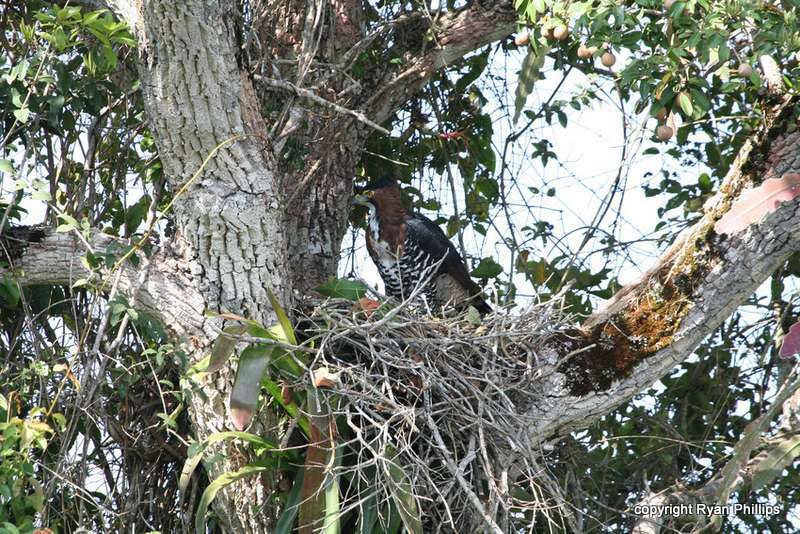 The Ornate Hawk-eagle feeds mostly on birds, including larger birds such as currasows and guans! This is no small feat considering that a Great Currasow can weigh upwards of 10 pounds, while a female Ornate Hawk-Eagle, which is larger than a male, weighs in at around 3.5 pounds. But these skilled hunters won't only feed on birds. They also will take a host of other prey species, including small- to medium-sized mammals, large lizards, and snakes. Stealth and ambush are important aspects of this bird's hunting style. This powerful predator hunts mostly inside the forest, flying silently and swiftly between perches, capturing prey in trees and on the ground. 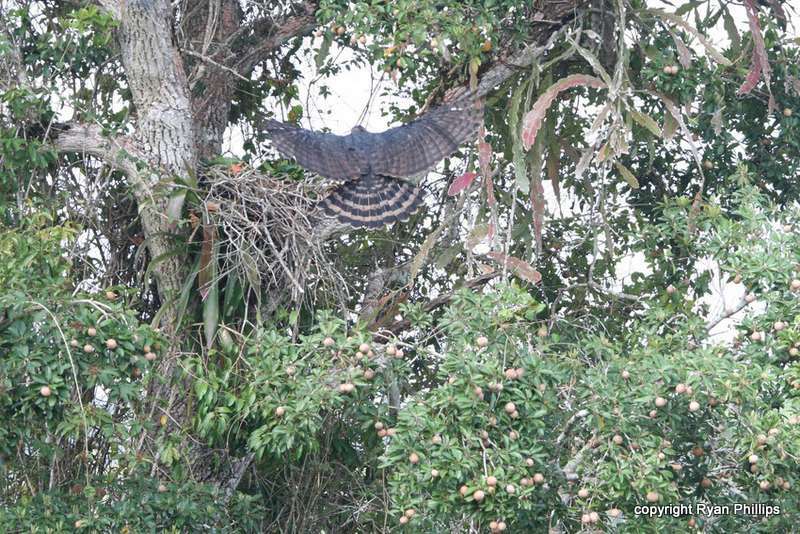 Some researchers in Peru documented this eagle watching for prey from well-hidden perches, then diving down on the ground to capture wood-rats. Individuals of this species were also seen diving into shallow water to capture gallinules and wood rails. A pair of Ornate Hawk-eagles will work together to build their nest. They use twigs, sticks and other vegetation to construct a bulky nest lined with green leaves. Because their nests are quite large, they need a good, solid spot in which to build them. They often choose to place their nests in the forks of large trees – sometimes using some of the largest, tallest trees in the forest. The pair may re-use the same nest from year to year, so it has to be well-constructed and sturdy. Unlike many other raptor species, Ornate Hawk-eagles generally lay only one egg per clutch. Their eggs are white with red-brown spots. While the female and male both take turns incubating, it is really the female that does the majority of caring for the egg and the hatchling. But don't worry. The male is doing his part, too. Over the 44 to 48 days the female spends sitting on her egg, the male works hard to find food for himself and the female. Even after the chick hatches, the male continues to provide food, but it is usually the female that feeds the young. The male drops off the food in a place close to the nest. The female then takes the prey from the male and brings it to the nest. She will then feed her young by carefully ripping off small pieces of meat with her beak and delicately passing it to her chick, which quickly gobbles it up. As the chick grows, both parents need to hunt and provide for it. The young hawk-eagle fledges, or flies for the first time, around 9-1/2 to 13 weeks after hatching. At this point, the male and female switch roles. Now it is the male's turn to care for his offspring until it disperses from the nest area. This could take up to a year! A successful breeding attempt from laying to dispersing lasts an average of almost two years. Because so much time is invested in caring for a young chick, this species usually breeds every other year. A visit to our World Center for Birds of Prey will be rewarded with an opportunity to meet Fancy, our resident Ornate Hawk-eagle. 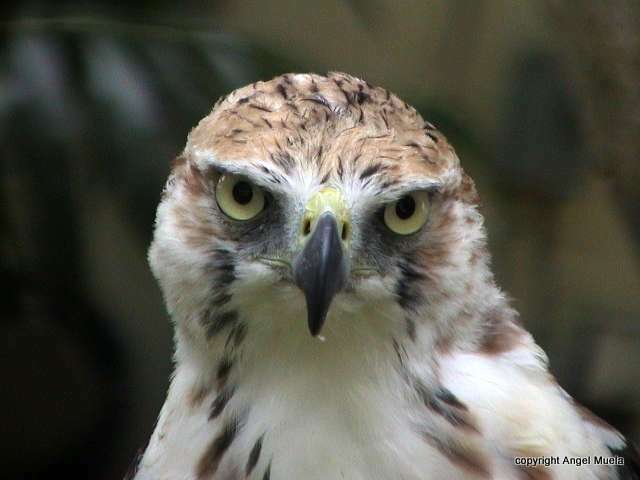 At the visitor center, you will see this amazingly colorful bird of prey up close in our outdoor aviary. Come learn about this unique species and all its rainforest neighbors.